On this day last year, things were not going well with regard to Isabelle’s speech. We were a day away from receiving her CAS diagnosis. She had been doing speech therapy for 10 months and had barely made any progress. To say I didn’t see the light at the end of the speech tunnel is beyond an understatement. 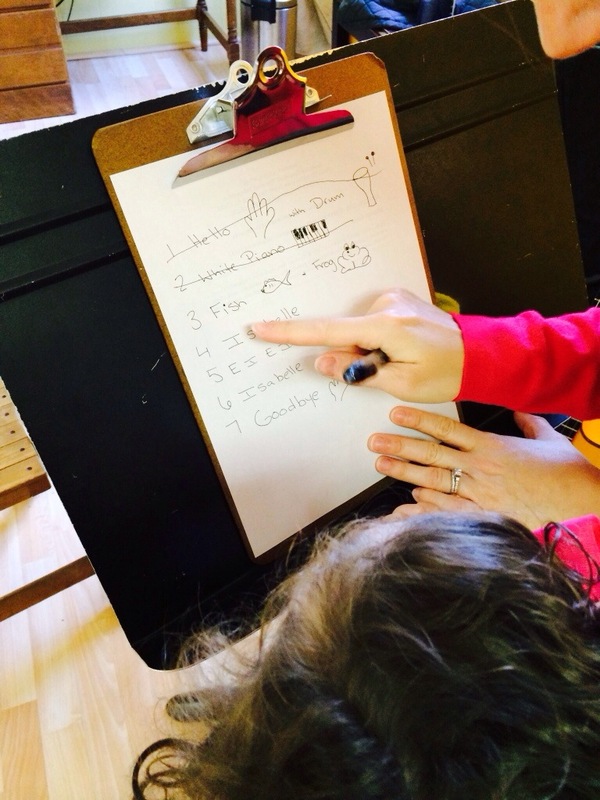 Isabelle has to follow rules when she uses the “white piano” at the music studio. Here she’s pictured playing with her pointer fingers. 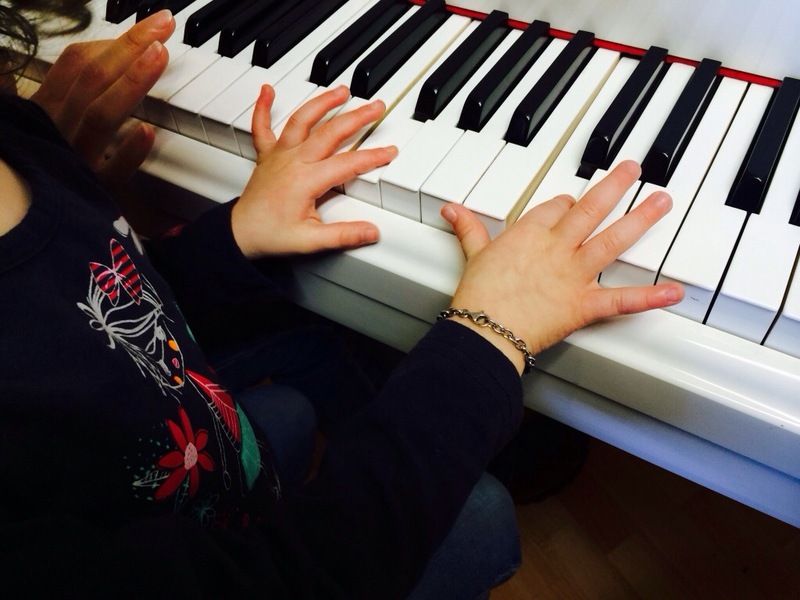 Two weeks after she was diagnosed with CAS, we began working with a music therapist. Slowly, through music, we were able to increase Isabelle’s consonant and vowel productions. Soon we heard approximations of words. Over time we understood real words. We have begun to hear short sentences too. As the parent of a child with CAS, this is a dream come true. While she has a long way to go, I can now see the light at the end of the speech tunnel! We’ve been working with Isabelle’s music therapist for almost a year now. While she used to come to our house, we now go to her office. Her office is actually a music studio complete with guitars, drums, pianos, a xylophone, and more. Isabelle LOVES going to her office for sessions since she loves to play, listen to, and create music. This morning we had a HUGE breakthrough. We were singing “Old MacDonald” with Isabelle. She picked out pictures of several animals on the farm and then needed to say the animal name and the sound it made. Plus, we were pausing so she could fill in other words. We’ve been singing this song with her in music therapy for almost a year. (Last April she couldn’t even move her mouth to move to say the “o” in E-I-E-I-O.) I knew she could fill in some of the animal names and sounds, but wasn’t sure she’d be able to fill in the words we were leaving out. She’s come a long way in 11 months! Whenever I question if I’m doing the right thing by taking her to five therapy appointments/week and doing lots of home practice, I have a moment like this and I know we’re traveling on the correct course. We have a ways to go since the multi-syllabic words are still tricky for her. Often the medial parts of the sentences are undecodable. However, she’s made tremendous progress and so much of it is thanks to music therapy. Crossing off items as they’re completed. But music therapy isn’t just great for speech. It’s been wonderful for getting Isabelle to follow directions and rules. Starting today, her music therapist created a schedule for our day that included pictures and words to help keep her on-task during our session. There were two free choice times (marked as “Isabelle” in the photo on the left) during the session, which allowed her to pick an instrument and do what she wanted. That’s really necessary when there’s articulation work and structured activities happening. Today I’m thankful for the magic of music. I don’t know if we’d be where we are today without it. Check out the other slice of life stories at http://twowritingteachers.wordpress.com. This is such a wonderful tribute to what music therapy can do! I love that you include audio clips too! What a great way to incorporate other types of media into your writing! The “questioning” of a parent to do right by their child . . . it’s lays so heavy doesn’t it? How wonderful that you found music for Isabella, and like you said is doing more than you thought it would! Good job Isabella and to you too! So glad that you shared Isabelle’s amazing achievement – bravo to you both! Congratulations on Isabelle’s achievement and progress. Hard work and perseverance do pay off. Congratulations ! This is a milestone worth celebrating! Thank you for sharing her amazing progress! Music is so powerful and a wonderful tool to connect with children. It’s amazing how often as parents we second guess our decisions–large or small! She is blessed to have you.